Open 2000/2001 is the most complete guide available covering the third Grand Slam. The large hardcover is compiled by Eugene Scott, a former player who currently acts as publisher of Tennis Week in addition to authoring 16 tennis books. 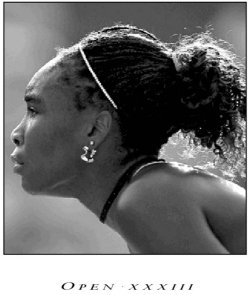 The 168 pages of Open 2000/2001 contain pictures and stories by some of the top tennis writers and photographers in the field as well as complete draws for all of the singles and doubles events at the 2000 U.S. Open. Included are also draws and photos from the junior championships. The younger set is not forgotten in this publication. In fact, Mr. Scott remarks in his dedication, "...junior tournaments are a fixture at Flushing Meadow. Teenagers aren't allowed at nearby Shea Stadium except as batboys." Stories within the volume range from those about players like Swashbuckling Safin by Richard Evans and Survivor: The Sequel by Andrea Leand to more general stories like Number Seven Train Sights by Joseph Stahl, Must Be In The Front Row by Kevin O'Keefe and Baseline To Bull Market by former Pepperdine coach Allen Fox. While they are all well-written and enjoyable, some of the stories -- like Lights! Camera But Not Enough Action -- seem outdated. (Discussing the 2000 television coverage of the Open and its pitfalls seems irrelevant when the networks involved had already changed a lot of their coverage in 2001.) Fortunately, these stories are the minority. One feature of Open 2000/2001 that I really enjoyed was the US Open Netscape. This retrospective includes quick summaries of the 1968-2000 championships. Among the paragraphs are notes about the 1971 debut of 16 year old Chris Evert and the 7-6,6-1,6-7,5-7,6-4 spectacular in 1980 played by Bjorn Borg and John McEnroe. Another section in the book is Rally Back, a breakdown of major Open events by date. An example of this is the highlights of September 1st, the day that: John Newcombe became the first top-seeded man to lose in the first round (1971); Fifteen year old Michael Chang became the youngest man to ever win a match at the Open (1987); Goran Ivansevic and Daniel Nestor played the longest tie-break in history (1993); and Patrick Rafter nearly became the first defending champion to lose in the first round (1998). Open 2000/2001 is published by Tennis Week and is available by calling 1-800-800-TENN.